Club Penguin Cheats by Mimo777 Club Penguin Cheats by Mimo777: Club Penguin Construction Reviewed By You! "Well, me and my friends are pretending to be managers! Were both agents (or are we) and were keeping all the workers stuffed on pizza! That's because we can't allow too many breaks. We've been working mainly on the Sports Shop and selling the rest of the popcorn! We've been working also on that badge-or-heart shaped thing (do I know what it is or do I not know? ), selling popcorn, working on the crane, and that stone. We hope to get everything fixed up!" With lots o' adventures happening this month, Club Penguin wants to know what ONE thing you would like to take on an adventure? If you would like to write an article for Reviewed By You, click here. Hey Mimo!!!! I wanted to ask if you could find out about a mission, involving ninjas? It would be soooooo cool. You know, fire ninjas using hot sauce to capture Herbet? Wow excellent idea I would love that it could come out who knows? Thanks for commenting and hope you have fun with the EPF! Sorry, but Mimo doesnt take special requests and he isn't any different from you and me. Think... how would they reply if you questioned them? The would reply the same, We can't give out too much info. And just because you want a mission involving ninjas, doesn't mean that they will make 1 for you! Hope you can understand. Mimo I think Gary is in the EPF HQ! Mimo! I saw this really funny cookbook! It has winnie the pooh!and guess what its called?Cooking with POOH! Doesn't it soun great? P.S. Pinguoo6, Lightbulbs are a little too crunchy for me.They hurt! Does the EPF have anything in store for us recently? And has there been any news about it? Question 1: Besides the code from Herbert's Revenge that unlocks an EPF outfit and Flare the elite puffle not really. Im sure they will have lots of new things in the future for EPF agents. Question 2: Well the news now is that theres lots in store for EPF agents. Possibly from the Club Penguin post yesterday of whats coming in June might have been something about it. They showed us a few pictures. Were not quite sure about the them yet. Keep checking. Im sure Club Penguin won't fail us. Waddle On! I Know! I Know! i just figured it out! remember the blue sign that said 'W' that was the Winter Sports sign! they painted it to put Everyday Phoning Facility! Gosh, so harsh! Did you have a bad day or something? 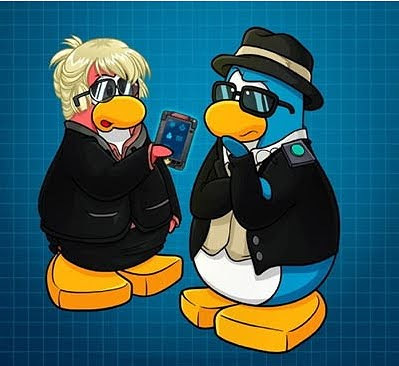 i can't wait until the EPF room is finished and i hope i become a cpg moderator and my penguin name is Fire Ningas6. I would like that! And Water Ninjas using fish! Yeah! BTW, the Phillies are LOSING to the Braves! #1 in the division! Oh yeah! Food?! Who needs food? The biggest necessity to survival is a monkey! :O I will find him! Lol, that sounds SO tasty! Cool! Hope you do! Just mod a lot! You can find the rules somewhere on this site! I would take a stuffed bunny cause stuffed bunnies give you comfort! Not lightbulbs for me though. They always seem to like to pop in my face and blow my fuse... Literally. Lol, Waddle On! I can't wait either! And all you have to do to be a CPG mod is answer questions in comments. After your done answering the questions put your name and (CPG MOD). Remember not to put (CPG MOD) next to your name when your not modding. If you need anymore help you can look on the right side of the screen in the section that says Be a Club Penguin Gang Mod! Good luck! We have kind of already used hot sauce in missions. Just saying XD But ya ninjas would be cool. Maybe rookie will be a ninja in the next one. A life time supply of cheese whiz! fluffy~ when you said "gary" i thought you meant the snail in spongebob for a second! lol!!!! I would take a magic lamp! ..If i find one..lol..if I don't, I would take a mobile! Hehe..
Hey guys, I'm having a Summer Party in my igloo on June 9th at 1:30 pm Penguin Standard Time! Hope you can all show up! I don't have very many summery stuff since I'm a new member, but come dressed up for it! Neither can I the epf room looks really cool and good luck with that. hey mimo i just noticed this today, that on the sign for the "Everyday Phoning Facility" see the first letters of each word? EPF. lol thats so cool! That's because coolio is MY word! But you can use it! Just don't put too many !!!. Lol! Gary the gadget snail! Wait.. lamps are magic?! I have a whole huge lamp collection! Thanks! *turns around to see lamp collection get run over by a truck with G in it* Thanks a lot, G! Yeah, that's seems like a pretty good idea! I will come! I have TONS of summer stuffz! Yeah, pretty awesome! But don't put (CPG mod) if your not modding! Thanks! Yeah! Also, the checklist in the old HQ had that too! Hey Mimo! I'm on Wenks, just to let you know! Come if you want! Yes! But Mimo already noticed that and posted it. Keep your eyes open for more! Cool! lol.. But do you have a monkey? Cool! What server is it gonna be on? Hi Mimo 777 , I look at your website every day and was wondering if you would like around 100 ,000 more coins. if you do want more coins i reccomend penguin gold's money maker. I think I would bring a couple of friends and they could bring some friends that can bring everything we need. i would choose uh... i guess a pie maker cuz i need pie!!! oh and BTW i just noticed something that is SOO COOL! i logged on 2day and i saw some items i never bought. it showd that they were unlocked items and then it hit me: THEY WERE THE ITEMS I HAVE IN MY EPF GAME! i got them free! its awesome! hey mimo u know how on the members page of CP they have one of the upcoming events as "hunt for new outfits and rare items to get you set for the island Adventure Party"? could this mean that we get to find old and rare items like the red lei? You got to get Klutzy up there by having Pop the purple puffle blow a bubble to take him up there. Now pop Pop's bubble with Blast the red puffle. Give it a try! Good luck! Hey guys, just an update, the swerver for my party is ICEBOUND. VOTE FOR THE PARTY YOU WANT! And if we enough votes, we could send it off to Billybob. I noticed that in the EPF command room on a board it says report for duty on the 15th June hopefully that means something new! i know how to get 100% stealth you through a snow ball at the camera!